I'm currently writing in a state of relaxed bliss after 5 extremely chilled out days in Phu Quoc. 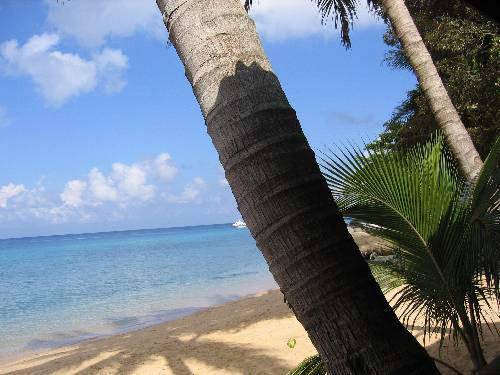 Phu Quoc is a small island off the south coast of Vietnam in the gulf of Thailand. I think it is actually closer to Cambodian mainland than Vietnamese, but its part of Vietnam. Phu Quoc was a last minute decision to visit, and I'm really pleased we did as it has been amazing. The island has some of the best beaches I have seen. Soft white sand, and gently lapping clear blue sea. Thanks to a lovely pressie from my brother, we treated ourselves to a lovely beach hut for the first few nights, with the best view ever. We've downgraded a bit now, to a weird resport, still really nice, but bizarre clay animals all over the grounds. Very very odd. The beach where the resorts are is pretty nice, and certainly wouldn't disappoint on a holiday. As you lounge in the sun, ladies with big platters of fresh fruit ply the beach. For 40p they give you a whole pinapple, cut up and sliced while you watch. One day we tried a 'Booey' (doubt this is how you spell it, but it is how you say it). Its a kind of giant grapefruit, with quite textured skin, and sweeter than a grapefruit. It was really tasty. As it was my birthday so recently, I also treated myself to a pedicure... again from a lady plying her trade along the beach. A full scrub and nail painting cost a whole 3 pounds. And she did a great job. Today, as its our last day, Matt and I are going to treat ourselves to an hour massage each... for a whole $2. Not a bad life. The best beaches here, though require a bit of independent travel. We hired some bikes and took to the very dusty roads for a bit of a tour of the island. We managed to find an absolutely beautiful beach that was completely empty. We decided we couldn't miss an opportunity like that and decided to shock the local fish life with a bit of skinny dipping. Mind you, our white bums could probably be seen for miles around glowing through the water! All very liberating... until a fishing boat came into the horizon, and then some rapid reclothing was required! We also went on a night time squid fishing trip whilst we were here. We went out on big lit up boats, designed to bring the squid to the surface. This was fun, but not too fruitfull. We didn't catch anything! Locally our guide had more luck, and caught plenty, along with an octopus. One squid got a bit angry and squirted ink over everyone and everything in the vicinity. This was all followed by BBQ squid and squid porridge on board. Sounds a bit gross, but actually more of a rice soup than porridge, and tasted very good. Matt and I have strangely felt like celebrities whilst here. On our first day a photographer from a Swedish travel supplement was taking pictures of the beach and asked if we could be her 'models'. We thought this just meant a snap, but she actually then made us spend 30mins rolling around in the waves pulling various poses. I dread to think what they'll come out like. All I can think is it is because we look quite fair, so could possibly pass for being Swedish. Then on the fishing trip, a boat of tv crew came on board from a Ho Chi Minh Tv channel and took our pictures. Matt ended up doing a interview with them on why we are here in Phu Quoc. He was a natural! Anyway, too much excitement really, so we better hit the road and move on. We are leaving this lovely island tomorrow and are hoping to make our way to the Cambodian border through the Mekong Delta. I think we are heading for some serious rice farming country.